As anyone who has had a breakout before will know, healing the blemish is only half the battle. The discoloured (red/purple/brown) “post inflammatory hyperpigmentation” mark that gets left behind can look worse than the actual spot ever was and take even longer to heal. Of course, this doesn’t happen to everyone or in all cases and depends on many factors like skin tone, size and depth of the blemish or whether you picked it etc etc, but when it does happen, it’s pretty frustrating. As I have brown (Indian) skin I am prone to PIH as a rule, no matter what I do or don’t do but this time I was pretty lucky. I’m guessing that because my skin was in great shape before the reaction and because I was able to heal my skin so quickly, the PIH wasn’t all that bad. I was easily able to cover them with concealer and wasn’t worried about it at all. Well, that is until I spent two days working outside on some of the hottest days ever recorded across the planet (I’m not exaggerating, it was in the news – hello global warming!). Even though I am pretty diligent about sunscreen, this job was a crazy one and there was absolutely no time for me to reapply it throughout the day as I should have. I thought I would be ok as I was running around, sometimes in the shade and not always in direct sunlight but once I got home and cleansed my face I knew right away that I had messed up. I had most definitely tanned and the dark spots? Wow. They had deepened so much and sadly continued to do so over the next few days until they were the darkest I had ever experienced before. It was pretty upsetting but I knew that just as I had been able to heal my skin from the initial reaction (Part One), I could fix this too and I did. Obviously, it didn’t happen as quickly because hyperpigmentation takes weeks to heal but it did happen and now my skin is about 85% back to normal. Woo! I wanted to share this experience with you because if you ever thought sunscreen was an option, it isn’t. If you have acne or are dealing with breakouts, then sunscreen is a must to make sure that once the blemish is gone you aren’t left with PIH marks that aren’t nearly as easy to heal. These are the products that I used back in July and August deal with my uneven skin tone and hyperpigmentation. Over the past few weeks some new products have been introduced that have also worked wonders but back when it happened, this is what I used and they really helped. Again, everyone’s skin is different and just because these worked for me doesn’t mean they will for you, but because hyperpigmentation is so hard to deal with I really wanted to share with you the products that I have had great success with incase they could help you too. Enjoy! This product needs no introduction at this point as I have raved about it for well over a year now. It is an incredible serum for quickly healing injured skin and I incorporated this back into my routine once the blemishes were gone to heal the skin and then address my uneven skin tone and hyperpigmentation. I used this day and night along with SDSM and it just reaffirmed to me how important this product is for overall skin health and how wonderful it is as a reparative treatment. 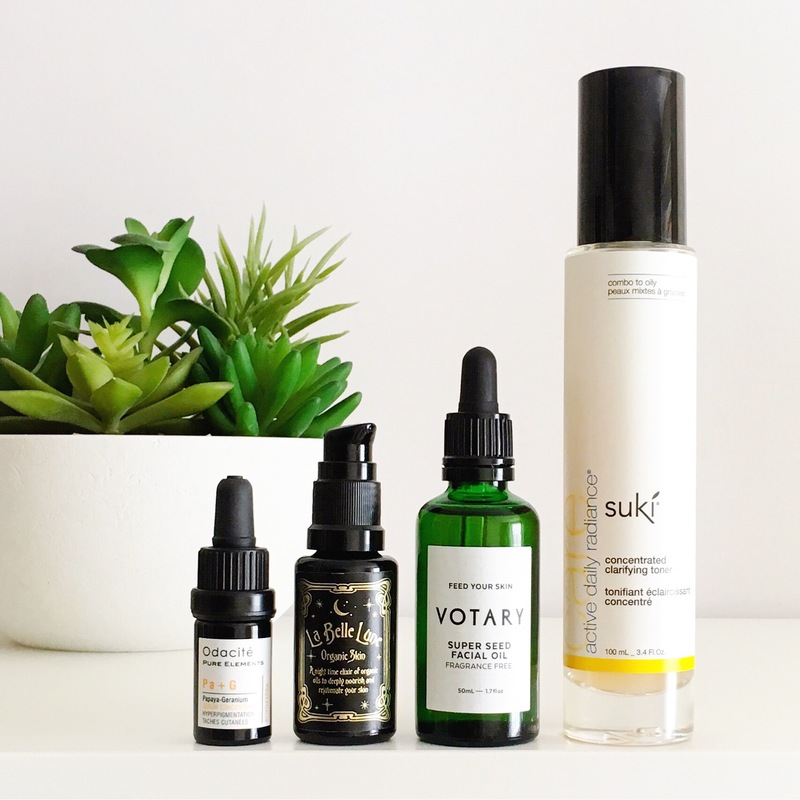 I know that so many of you use this now and have experienced for yourself how amazing it is, but if you’d like to know more about this super serum then I have done a full review on it here. This is easily one of my most favourite launches of 2016 simply because it works and very, very well. I used this consistently when it first launched back in February and started to see visible results in just 3 weeks, which is very fast for hyperpigmentation. 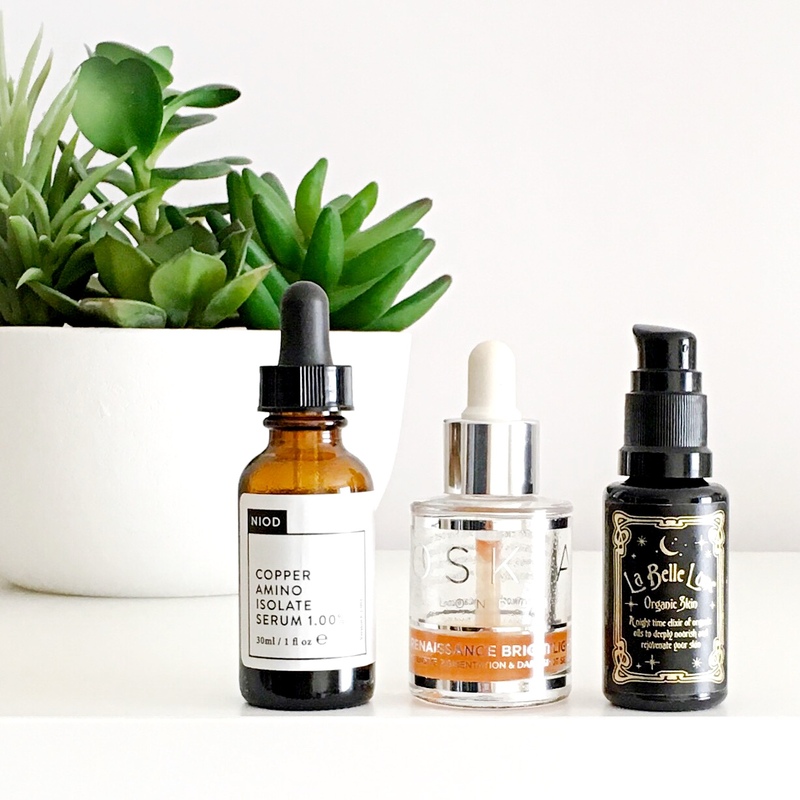 I continued to see great changes to the tone, texture and luminosity of my skin until it was near perfect and I largely credit this serum with that. It contains 13 brightening actives like Niacinamide, Arbutin and fruit AHAs and enzymes to “reduce all forms of over-active melanin”, so this is what I reached for first when I saw what had happened to my skin. I used this every morning and on alternative nights to the Voicemail Masque and SkinRise Bionic Tonic and I seriously fell in love with it all over again. I can’t stress enough how well it works and I am so thankful that I still had some left because it really made all the difference. I have a full review of this product here and I really hope OSKIA find a US retailer soon because they are too good of a brand not to have a bigger global presence. Ingredients: Aqua (Water), Sodium Ascorbyl Phosphate (Vitamin C Phosphate), Niacinamide (Vitamin B3), Dimethyl Sulfone (MSM), Zinc Glycinate, Arbutin, Glutathione, Lepidium Sativum (Cress) Sprout Extract, Lactobacillus/Pumpkin Fruit Ferment Filtrate, Ascorbyl Palmitate (Vitamin C Palmitate), Sodium Hyaluronate, Tocopheryl Acetate (Vitamin E Acetate), Leuconostoc/Radish Root Ferment Filtrate, Glycerin, Citrus Limon (Lemon) Fruit Extract, Maltodextrin, Lecithin, Passiflora Edulis (Passion) Fruit Extract, Ananas Sativus (Pineapple) Fruit Extract, Vitis Vinifera (Grape) Fruit Extract, Carica Papaya Fruit Extract, Rhodinols (Natural Rhodinol), Inulin, Alpha-Glucan Oligosaccharide, Cymbopogon Martini (Organic Palmarosa) Oil, Anthemis Nobilis (Organic Roman Chamomile) Flower Oil, Rosa Damascena (Organic Rose) Flower Oil, Linolenic/Linoleic Acid, Cinnamomum Camphora Linalooliferum (Ho) Wood Oil, Saccharomyces/Magnesium Ferment, Pelargonium Graveolens (Organic Bourbon Geranium) Oil, Saccharomyces/Copper Ferment, Saccharomyces/Silicon Ferment, Saccharomyces/Zinc Ferment, Saccharomyces/Iron Ferment, Jojoba Esters, Juniperus Mexicana (Cedar) Wood Oil, Eugenia Caryophyllus (Organic Clove) Bud Oil, Phenethyl Alcohol, Potassium Sorbate, Ethylhexylglycerin, Sodium Bisulfite, Disodium EDTA, Alcohol, Alcohol denat., Phenoxyethanol*, Citronellol**, Geraniol**, Linalool**, Eugenol**, CI 77491 (Iron Oxides) * We do not use phenoxyethanol as a separate preservative. It is found as a component of one of our actives. ** Natural component of essential oils. This was the only product that I used for both healing my breakouts and hyperigmentation because it does it all. It contains an incredible list of organic ingredients that naturally address all kinds of skin issues and concerns. In this case, the Rosehip Seed Oil, Milk Thistle Seed Oil, Avocado Oil and Chia Seed Oil worked together to block UV damage, reduce acne scarring, improve skin tone and texture, as well as provide overall brightening and radiance. This is one of the most hardworking, skin loving oils out there and you can read more about it in Part One or in the full review here. I mixed this with Odacite‘s brilliant Pa+G Serum Concentrate for a skin brightening powerhouse combo (below) and it’s something I still do now because it works so well. Ingredients: Rosa Rubiginosa (Rosehip Seed Oil) Silybum Marianum (Milk Thistle Seed Oil) Prunus Amygdalus Dulcis (Sweet Almond Oil) Salvia Hispanica (Chia Seed Oil) Hippophae Rhamnoides (Sea Buckthorn Oil) Persea Gratissima (Avocado Oil) Lavandula Angustifolia (Lavender Essential Oil) Simmondsia Chinensis (Jojoba Seed Oil) Rosa Damascena (Rose Otto Essential Oil) Boswellia Carterii (Frankincense Essential Oil) Daucus Carota Sativa (Carrot Seed Essential Oil) Rosmarinus Officinalis (Rosemary Leaf Extract) *d-Limonene, *Geraniol, *Linalol, *Farnesol *Naturally occurring in Essential Oils. Cautions: For external use only. Keep out of reach of children. We thoroughly recommend a skin patch test 24 hours before use in case of sensitivity. If pregnant consult with your Doctor before use. We also advice caution in case of nut allergies due to the use of Sweet Almond oil. When this treatment masque (review) first debuted as a pre-launch free gift it was shrouded in mystery. There was no name on the bottle nor an inci list on the box and all we got was instructions on how to use it and what it does. Before this incident with my skin I had been using this about once or twice a week and really liked it. It’s an overnight masque designed to address uneven skin tone and “stressed” skin and it definitely made my complexion noticeably more “glow-y” after each use, so enlisting it to fix my skin was an easy choice. The star ingredient in this masque is Lactococcus Ferment Lysate, which is a fairly new probiotic ingredient that promotes accelerated skin renewal, improved skin barrier function and cell cohesion, as well as increased epidermal growth for better skin health and quality. It also encourages the shedding of dead skin cells without causing any of the usual side effects seen with this type of product. This is why I chose this over traditional acids and retinols in the beginning because the last thing I wanted was to cause any more irritation or inflammation that would cause purging or another reaction. I wanted to get rid of the hyperpigmentation quickly but carefully and this helped a lot. I could kick myself for not signing up to the Victoria Health waitlist for this because they very generously sent it out to those on the list pre-release again and now I’m almost half way through with absolutely no idea of when it launches! Luckily, Lactococcus Ferment Lysate is also the main ingredient in NIOD‘s acid and retinol alternative NAAP serum (review), so I’ll be using a mix of the two until I can repurchase the masque. Ingredients: Lactococcus Ferment Lysate, Dimethicone, Centaurea Cyanus Flower Water, Glycerin, Dimethicone/Vinyl Dimethicone Crosspolymer, Hydrooxyethyl Acrylate/Sodium Acryloyldimethyl Taurate Copolymer, Propanediol, Aqua (Water), Pentylene Glycol, Origanum Vulgare Leaf Extract, Leontopodium Alpinum Callus Culture Extract, Plantar Lanceolata Leaf Extract, Melanin, Sodium Hyaluronate, Arginine, Sodium Chloride, Isohexadecane, Polysorbate 60, Xantham Gum, Citric Acid, Ethoxydiglycol, PPG-26-Buteth-26, PEG-40 Hydrogenated Castor Oil, Potassium Sorbet, Sodium Benzoate, Ethylhexylglycerin, Phenoxyethanol, Chlorphensein. Even though I didn’t want to use traditional acids or retinols, I knew it was important to have some sort of exfoliating action and luckily I had recently been introduced to this brand by a dear Aesthetician friend, so this is what I went for. These exfoliating pads contain PHAs (Gluconolactone, Glucoheptonolactone and Lactobionic Acid), which are derived from sugar and have larger molecules than AHAs (glycolic and lactic acid). This means they should cause less irritation and as someone who is quite sensitive to acids, I definitely found these to be very gentle. I used these twice a week in the evenings and didn’t experience any negative side effects that usually comes with acid use like stinging, redness or sensitivity. I’m not a huge fan of all the ingredients (preservatives, fragrance, silicones and a dye, randomly) but in this case and because of the severity of what I was dealing with, I was happy to use the product because it really helped to gently encourage cell turnover and reveal brighter, clearer skin. If you’re not a fan of AHAs and BHAs then this type of product could be a great alternative for you. Ingredients: Aqua (Water), Butylene Glycol, Polysorbate 80, Propylene Glycol, Gluconolactone, Glucoheptonolactone, Glycerin, Mentha Piperita (Peppermint) Oil, Algae Extract, Lactobionic Acid, Citrus Grandis (Grapefruit) Fruit Extract, Arginine, Eucalyptus Globulus Leaf Extract, Tocopheryl (Vitamin E) Acetate, Cucumis Sativus (Cucumber) Fruit Extract, Retinyl (Vitamin A) Palmitate, Tetrahexyldecyl Ascorbate (Vitamin C), Camellia Oleifera (Japanese Green Tea) Leaf Extract, Menthyl Lactate, Ammonium Hydroxide, Polysorbate 20, Disodium EDTA, Methylparaben, Phenoxyethanol, Chlorphenesin, Parfum (Fragrance), CI 42090 (Blue 1). I have been a huge fan of snail secretion filtrate for many years and love how brightening and healing it is for the skin. 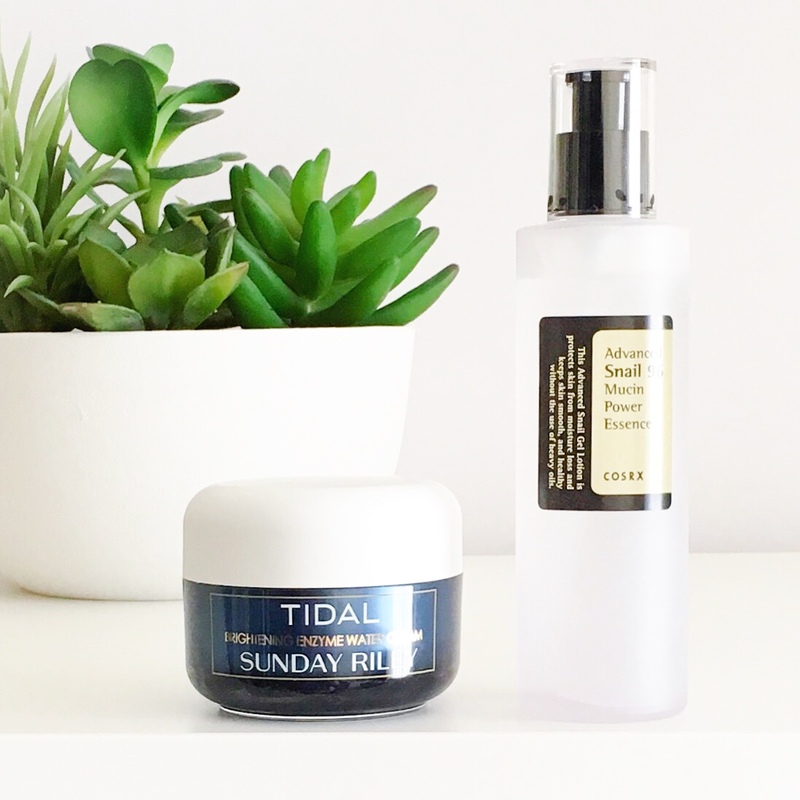 Because I couldn’t hid from the sun until my skin was all better, I wanted to make sure I was using the very best products for my daytime routine and this was one of them. I used this daily to boost hydration, healing and brightness because long before I had discovered any of these other products this ingredient had provided excellent visible results in the past. I used this after toning and before my OSKIA serum and sunscreen. I just wanted to make sure that every step was working towards getting rid of my hyperpigmentation and I felt reassured of that by using this essence, as the main ingredient had worked so well for me in the past. I will be doing a review of this soon because I have three of the Cosrx essences and I love them. Ingredients: Snail Secretion Filtrate, Betaine, Butylene Glycol, 1,2-Hexanediol, Sodium Hyaluronate, Panthenol, Arginine, Allantoin, Carbomer, Phenoxyethanol. Not all of my days were spent working outside, so when I didn’t need sunscreen I used this product as the last step in my morning routine instead. I was so surprised by how much I liked this because I usually don’t get on with moisturizers but this has been lovely. Aside from how light and hydrating it is, I love the fact that it also tackles hyperpigmentation thanks to ingredients like Alpha Arbutin (1%), Papaya Enzymes and White Bird of Paradise Extract. This again just boosted the healing and reparative powers of everything else I was using and gave me the peace of mind that I was doing and using everything I could to quickly but gently fix my skin. This is now one of my favourite moisturizers and it’s my go-to for non-sunscreen days. Ingredients: Water, Hydrolyzed Jojoba Esters, Glycerin, Caprylic/Capric Triglyceride, Propanediol, Sodium Hyaluronate Crosspolymer, Pentylene Glycol, Tamarindus Indica (Tamarind) Seed Gum, Ethyl Macadamiate, Sodium Acrylates Copolymer (and) Lecithin, Isododecane, Adipic Acid/Neopentyl Glycol Crosspolymer, Lauryl Dimethicone, Hydrogenated Polyisobutene, Strelitzia Nicolai (Bird of Paradise flower) Seed Aril Extract, Alpha-Arbutin, Aesculus Hippocastanum (Horse Chestnut) seed extract, Hydrolyzed Hyaluronic Acid, Allantoin, Papain and Carbomer 1, 2-Hexanediol (and) Caprylyl Glycol (and) Algin, Cucumis Sativus (Cucumber) Extract, Melia Azadirachta (Neem) Leaf Extract (and) Melia Azadirachta Flower (Neem) Extract (and) Amino Esters-1 (and) Coccinia Indica Fruit Extract (and) Solanum Melongena (Eggplant) Fruit Extract, Aloe Barbadensis Flower Extract (and) Lawsonia Inermis Extract (and) Ocimum Sanctum Leaf (Holy Basil) Extract, Pearl Powder, Fragrance, Synthetic Fluorphlogopite, Titanium Dioxide, Phenoxyethanol, Chlorphenesin. The past few weeks have been an exciting time for skincare with revolutionary new launches like The Ordinary, exciting new releases like this Oxygen Booster serum from Omorovicza and the reintroduction of one of my all time favorite products in the form of Tata Harper’s legendary Resurfacing Mask. All these products have now been incorporated into my routine to continue the hyperpigmentation healing and what a difference they have made! 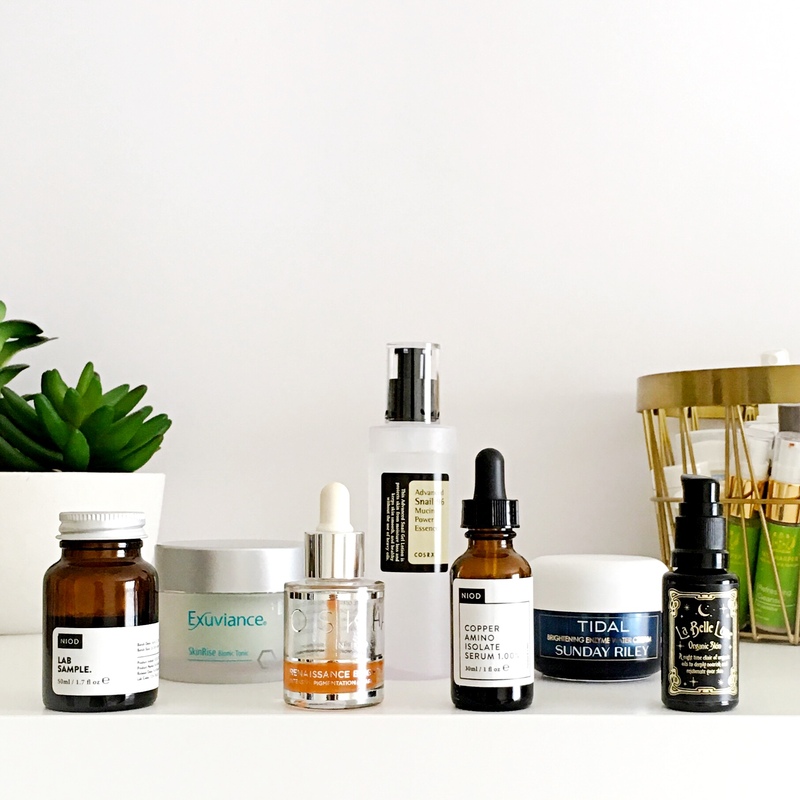 I have previously talked about the Resurfacing Mask (here, here and here) and there will be a full review of these products from The Ordinary (you can read an introduction to the line here) and Omorovicza soon because they have seriously done wonders for my skin. When these were introduced into my routine my skin was probably at about 70% healed and now it’s almost back to normal. These products could not have launched at a better time for me and I can’t wait to tell you more about them. This experience was a huge learning lesson for me and the upside is I now have an arsenal of great products to heal my skin should this ever happen again. PIH is really a game of patience and consistency but with the right products and ingredients you can reduce how long it takes the skin to heal from it. 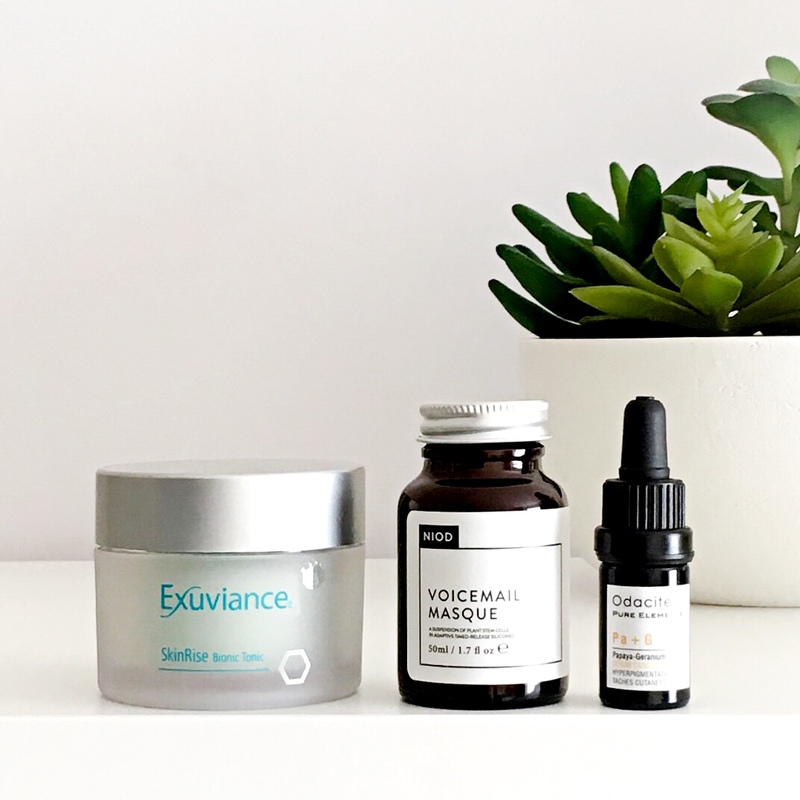 The main ingredients that have made the biggest difference are Niacinamide (OSKIA, The Ordinary), Alpha Arbutin (OSKIA, The Ordinary, Sunday Riley), Retinoids (VERSO, The Ordinary) and PHAs (Exuviance) and Lactococcus Ferment Lysate (VM, NAAP). They worked together to repair, renew, heal and brighten the skin and heal my hyperpigmentation quickly. PIH or any type of skin discoloration is a nightmare to deal with but this is what worked for me and I hope they work for you too. If you have any other tips or products you have had success with I would love to hear them because the more options we have to heal our skin, the better. This is a great selection. I’m currently using the NIOD copper amino isolate serum. Thank you so much James! I love CAIS – how are you liking it so far? Acne is getting under control, but marks and pigmentation are still there. I was very excited to when The Ordinary range came up last year, i’m already using some if the products: HA+AA, Rosehip oil and Retinoid. The reason for my excitement was mainly the affordability of these products! But I think my skin needs a stronger army, like the products you mentioned above. I wouldn’t be able to afford most of said products, but I could get 1 (or maybe 2), which one would you recommend? An affordable super skin saviour! Or would you be able to suggest alternative products that could help? Other products I’m currently using: White Balance Click (Medik8), a vitamin C serum, Paulas Choice BHA lotion, etc. And on Duac Gel to control spots. Ive got a combination skin type (more in the dry side than oily), and I tend to suffer dehydration over winter months. Apologies for the long question, but I’d appreciate any advice you could have. Thank you Arly! Yes, I never leave the house without suncream, currently using Bioderma photoderm spot, but already looking for something more protective for summer months. Anything you could recommend? I’ve been using the above products consistently for about 3 months, had to do some adjustments to fit in the antibiotics I was prescribed. Just re-ordered a new hyaluronic acid serum (also from Medik8, it’s been a skin saviour fir the last 2 winters) and a moisturiser (hydrance from Avene) to help with dehydration these cold days. I’ll need to stop the antibiotics anytime soon, so I’m looking at options to keep the skin clean and hopefully avoid breakouts. I thought I could treat myself to the Flavanone mud mask from NIOD, I’ve heard so many good reviews about it, or perphaps the Bravura BHA peel you’ve recommended before? Hi Claudia! Sorry for the late reply. I absolutely love de Mamiel’s Exhale Daily Hydrating Nectar, as well as Kypris Heliotropic and Drunk Elephant Umbra (will be updated soon). NIOD are releasing an SPF in April and that should be an excellent one. How’s your skin been lately? Have you stopped the antibiotics? 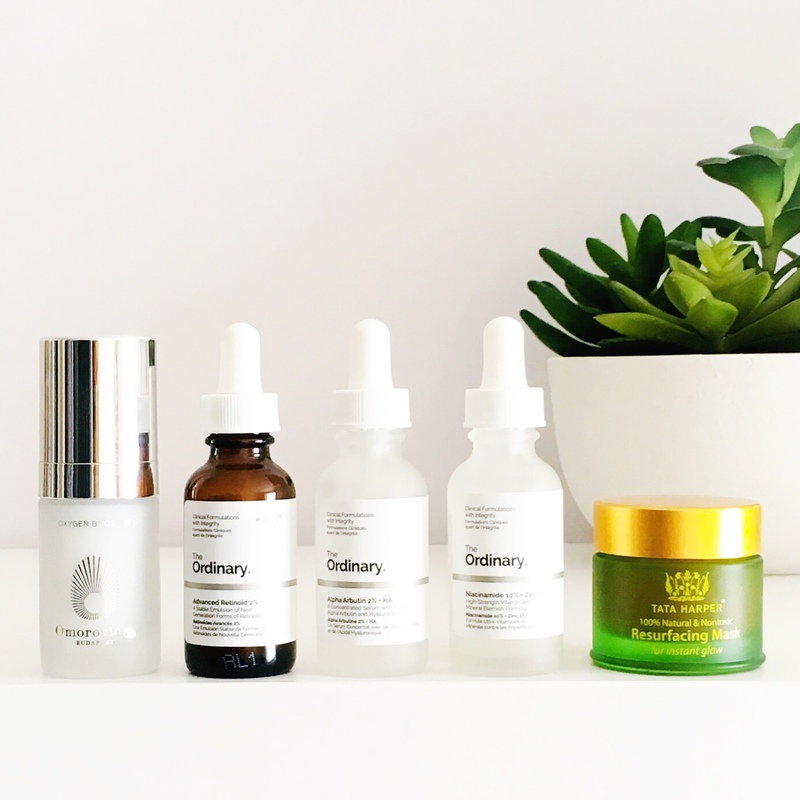 Try the Azelaic Acid from The Ordinary for breakouts. I have found that treating the skin gently is the best way to keep it balanced, clear and less reactive. The BHA Peel is good, but it might be too strong. I should have more reviews coming soon so stay tuned and thank you for all your support! how did you incorporate these into your routines? i mean how did you layer these. Hey, First of all, thanks for sharing your blog with us.I also want to share my experience of skin pigmentation with all of you. I am 23 years old, suffered from pigmentation problem from very long time. I tried many things to get rid of it but all become at zero results. After that my best told me about the “cysteamine cream”, I used that cream for 2 weeks and now I am totally fine. If someone had this kind of problem, they can use this.